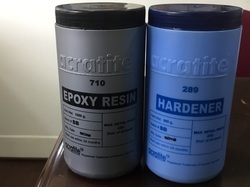 Leading Manufacturer of acratite epoxy resin-hardener -strong adhesive, resin-hardener bulk pack- strong adhesive strength for construction and acrabond 702 - 204 grouting compound from Vasai. 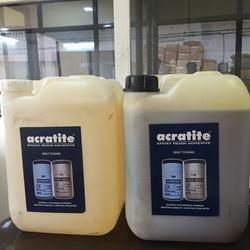 This is a two-component high strength epoxy adhesive used for bonding of Ceramics, Marble stones, Porcelain etc with itself or in combination with Metals. It has wide applications in all industrial component manufacturing & service applications. 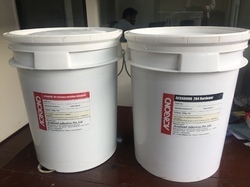 It is a two-pack system having a sufficient pot-life after mixing two parts in prescribed measures; this enables sufficient time for application on surfaces to be bonded. The full cure is at room temperature within 12 hours. It can also be used as coating compound when diluted with RD-2161 reactive diluent,which is non-volatile in nature, and has 100% reactive solids. This ensures no shrinkage after curing/setting. The film being flexible-resilient it absorbs impact loads and lateral movements if any, preventing leakage from joint surface. Mixing Ratio 100 PARTS RESIN TO 80 PARTS HARDENER BY WEIGHT. With an eager to serve the best, we are engrossed in manufacturing and supplying the finest quality RESIN-HARDENER developed espeicially for INDUSTRIAL & CONSTRUCTION INDUSTRY. It is a 2-part epoxy based fast setting structural adhesive, which is useful to bond any two substrates in construction industry. The curing is fast starts hardening within 30~~45 minutes full cure in 24 hours. Ideal for use in RCC construction. Steel & Mable bonding-Strong Strength. Used for Re-bar assembly, heavy machinery assembly. Looking for Epoxy Resin and Polyamide Adducts Based System ?